Harsdörffer used pieces of wood to make anagrams, designed letter-dice to teach children to build word combinations, and assigned numbers to letters to unlock a poem’s hidden values, earning him the title Der Spielende, or “the Player,” in the Fruchtbringende Gesellschaft. 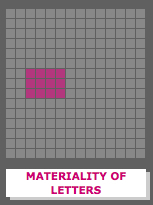 Each of these games uses language not as an abstraction, the purely rational product of the mind, but as quite literally a material object to be manipulated and moved, cut-up and combined. 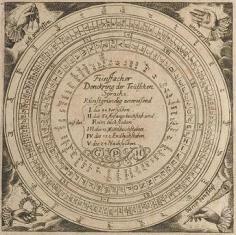 The Fünffacher Denckring der Teutschen Sprache, or the Five-fold Thought-ring of the German Language, is a database of the German language composed of five predicate variables: prefixes (forty-eight values), initial letters or diphthongs (fifty values), medial letters (twelve values), final letters of diphthongs (120 values) and suffixes (twenty-four values). Instead of using a table structure, however, each variable is inscribed along the edge of a disc and nested with each of the other discs, forming a simple combinatory mechanism that can generate any information stored in the database. This “alphabet of human thoughts” remained an undercurrent in Leibniz’s philosophy throughout his life, manifesting itself in a number of different plans: his dream for a networked encyclopedia in which, through linking, every entry was a microcosm of the human macrocosm (see Selcer 29); his lingua characteristica, or notation system for concepts “whose signs or characters serve the same purpose that arithmetical signs serve for numbers” (Leibniz 222); even his notion of “monads—discrete, irreducible primitives that nonetheless reflect the infinity of the spiritual cosmos. More specifically, Leibniz develops his “alphabet” through account of a mathesis universalis, a universal system for storing and generating knowledge.